Buchardt Audio unveiled brand new S400 loudspeaker model. 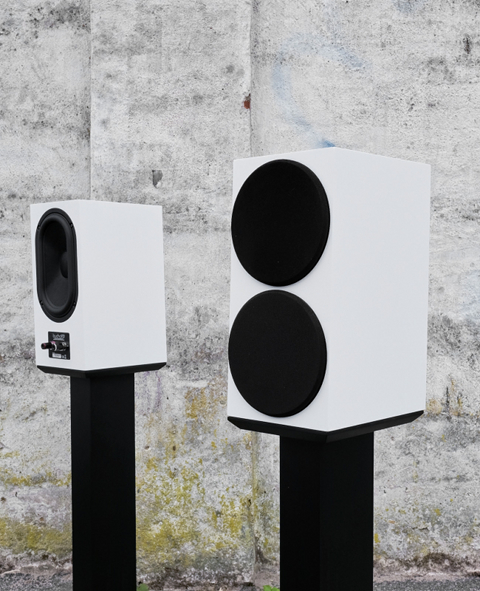 S400 is a compact, passive radiator loaded loudspeaker with an exceptionally well controlled directivity which was designed/simulated with state of the art computation methods. According to the press release, the secret to S400's exceptional controlled directivity is the Constant Directivity Control waveguide. It is designed/simulated with state of the art computation methods and was tested with a new, very advanced holographic near field scanner, mapping the complete acoustic 3d output using over 5,000 measurements on each of the 5 prototypes the company did. The result combined with the tiny 19mm tweeter is spot-on, Buchardt states. A challenge that had to be solved using the deep waveguide the design process ended up with, was the phase-shift between the woofer and the tweeter. This was solved by placing the waveguide under the woofer as well as with a very discreet tilt of the cabinet at only two degrees. This aligns the drivers in phase. Because of the high directivity of the waveguide, the edge diffraction from the cabinet is reduced up to 90% compared with standard tweeter placements most other speakers use, the company says. S400 sounds larger than one would expect, because the passive radiator used as a loading method. Some of its advances over the classic bass reflex port are that there is no port noise and no port compression and that the loudspeaker can be placed very close to a wall. Buchardt says that the use of passive radiator resulted in 30% reduction of cabinet size, while the loudspeaker goes all the way down to 33Hz. S400 is a two-way design, featuring a 0.74-inch soft dome tweeter with a CDC aluminum waveguide and a 6-inch aluminum cone mid/woofer. Published data include a sensitivity of 88dB, frequency response between 33Hz and 40kHz (±3dB) and a 4 Ohm impedance. The loudspeaker is already available and prices start at €2,000, including 25% VAT.